The orbits shown in this diagram color coded. The planets are white lines, and the asteroid/comet is a blue line. The bright white line indicates the portion of the orbit that is above the ecliptic plane, and the darker portion is below the ecliptic plane. Likewise for the asteroid/comet orbit, the light blue indicates the portion above the ecliptic plane, and the dark blue the portion below the ecliptic plane. The 33-foot-wide (10 meters) near-Earth asteroid 2014 EC will come within 38,000 miles (62,000 kilometers) of Earth's surface at 4:30 p.m. ET (2130 GMT) Thursday (March 6), NASA officials said. That's just 16 percent of the distance between our planet and the moon, which is about 239,000 miles (385,000 km) on average. You can see a video of asteroid 2014 EC's orbit arount the sun here. 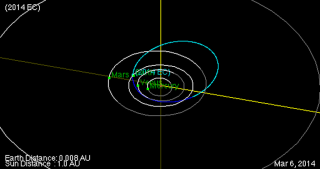 The flyby of 2014 EC follows closely on the heels of another space rock encounter. On Wednesday (March 6), the 100-foot-wide (30 m) asteroid 2014 DX110 zoomed by Earth, passing inside the orbit of the moon at a range of 217,000 miles (350,000 km).